The Truvox Valet Aqua 55IND is a 55 litre, industrial wet and dry vacuum cleaner with robust construction. 18 gauge stainless steel tank for long lasting durability. Durable trolley with push handle for easy manoeuvrability. 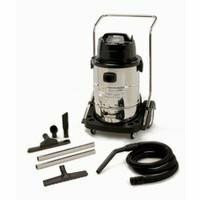 Industrial vacuum is perfect for hard floor maintenance jobs, recovering floor strippers and hard floor cleaners. The capacity and power for large water recovery jobs or dry debris pickup. Swivel hose connector allows 360° hose rotation, letting you move the vacuum without fear of disconnection. Tank hinges on frame for easy “tip and pour” emptying.